The steaks are high in this competition. Here's the real meat of the deal, though: Bungie has put something savory on the line in a community challenge. If any team of players can defeat Bungie's four-man teams in a round of Slayer by a margin of 20 kills or more (that is, hitting 50 kills when Bungie has 30 kills or fewer), the Halo studio will physically mail you not one but two Omaha steaks. This is a pretty delicious little challenge. Not only do players get the incredibly rare opportunity to try and flank the folks who made the game in the first place, but if they win, they get a nifty meal out of it, too! Still, I'm sure that Bungie's teams won't just lay down and let players filet them, so you'll have to work for your reward. 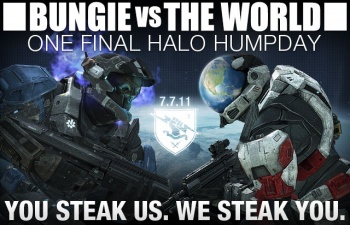 Any steaks remaining at the end will be grilled and eaten on webcam by the Bungie victors - such is the agony of defeat. Unfortunately, the steak offer only applies to US residents only. Anyone outside of the States who completes the challenge will be getting a gift card instead. Don't worry, guys - it isn't that Bungie has a particular beef with you, it's that it's one of those "really boring, but seriously necessary legal affairs." Bungie is doing more than a few community events for its final Halo-focused Bungie Day, but the "Steaktacular" event is really the prime cut of the lot. If you can manage to really grill a Bungie team and win a steak of your own, then I have just one thing to say to you, sir: Well done.